Discover the power of soft with Fairy Fabric Conditioner. Fairy Fabric Softner is dermatologically tested and hypoallergenic to ensure that it wraps your family's delicate skin in huggable softness. 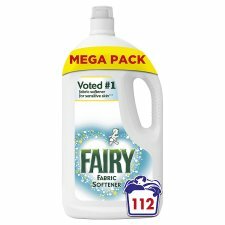 It is no surprise that Fairy Non Bio was voted no.1 fabric softener for sensitive skin (Online panel of 3433 females aged 18-70). Use Fairy Fabric Softener with Fairy Non Bio laundry detergent for even softer results. 112 washes based on 35ml per wash. Causes serious eyes irritation. Keep out of reach of children. If medical advice is needed, have product container or label at hand. IF IN EYES: Rinse cautiously with water for several minutes. Remove contact lenses, if present and easy to do. Continue rinsing. If eye irritation persists: Get medical advice/attention. IF SWALLOWED: Call a POISON CENTER/doctor if you feel unwell. Contains Delta-Damascone. May produce an allergic reaction. 112 washes per pack based on 35 ml per wash. See pack for full dosage instructions. Do not use this product on silk & wool. Recommended for professional use. Safety data sheet available for professional user on request.